There are several kinds of Streptopus, much like Dis-porum, but the pedicels of the flowers are twisted or bent. This is a fine plant, two or three feet tall, with a smooth, branching, bending stem and handsome leaves, thin in texture, with strongly marked veins and pale with whitish "bloom" on the under side. The greenish-white flowers are about half an inch long and hang on very slender, crooked pedicels, from under the leaves, and the oval berries are red and contain many seeds. This grows in moist soil, in cold mountain woods, up to an altitude of ten thousand feet and across the continent. The Greek name means "twisted stalk." White Twisted Stalk. 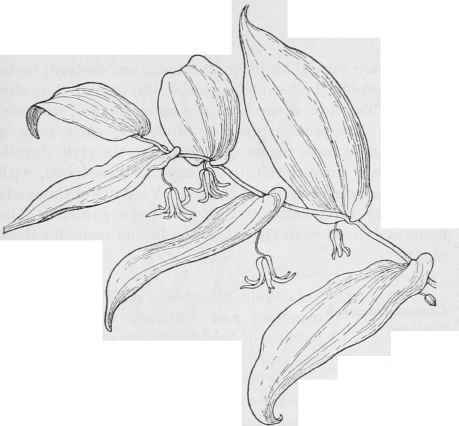 Streptopus amplexifolius.